The speed of diffusion of ICT sector indicates its much greater potential for catching up and becoming an important instrument to reduce world disparities. This is seen also by comparing implementation with respect to Internet users per 100 inhabitants with the implementation of other MDG indicators. The estimate for Internet users per 100 inhabitants was calculated from the ITU data for Developing countries for 2009 showed that S-time-distance would be -4.0 years (4 years ahead of the line to 2015 target of 25% penetration rate), indicating that the actual value for 2009 was expected to be reached on the line to target only in 2013. For 2008 analysing 194 countries showed that widely predominant share of population (88% of world population) is ahead of the line to target. This result is in sharp contrast with the Official Development Aid from the same Goal 8 domain, which is 4.6 years behind the line to target. This example shows that S-time-distance can be especially useful in comparisons across different indicators or indicators from different domains. The new generic time distance methodology offers policy makers, NGOs, media and the general public a new view of the implementation of the MDGs that is exceptionally easy to understand and communicate. 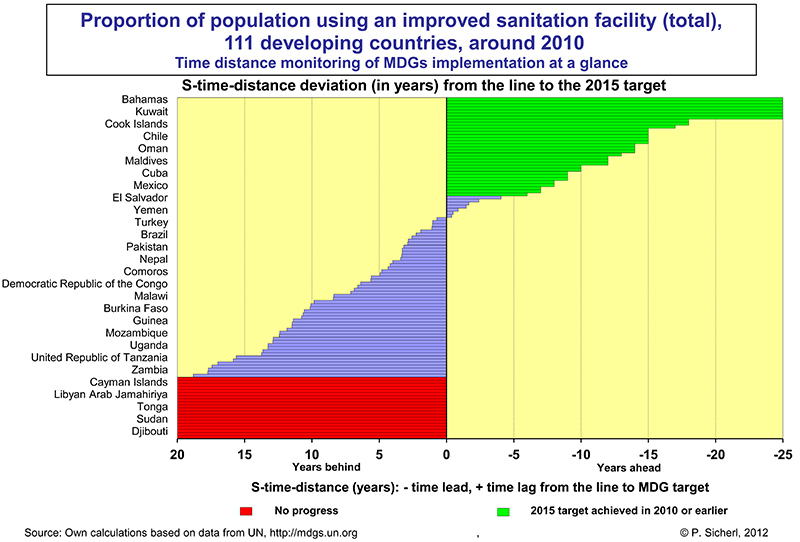 S-time-distance calculates the time lead or time lag of actual values from the lines to 2015 MDGs targets. It is like tracking the actual arrivals in comparison with the train (airplane, bus) timetable. The numerical MDG target for Internet users per 100 inhabitants is not clearly specified. Therefore we show the outcomes of a sensitivity analysis if the 2015 targets for Internet penetration rate would be 30%, 35% or 40%. Results for 6 world regions show that for Europe, Americas and CIS all alternative targets for 2015 would already be achieved in 2009, with the exception of CIS for 40%. For all four alternative targets the other three regions, Arab States, Asia & Pacific and Africa are ahead of the respective lines to 2015 targets. Higher targets for the indicator Internet users per 100 inhabitants reduce the time lead ahead of the lines to target but even Africa for the target of 40% penetration rate would in 2009 still be ahead of its line to target. This is in sharp contrast with some other MDG indicators where the delays behind the respective lines to targets were very substantial. By seeing with new eyes of the time distance perspective new perceptions of the situation with broader conclusions can be reached with new development stories from existing MDG data at the world, country and local levels. SICENTER developed a free web tool to facilitate this for interested users. The time distance monitoring methodology can be usefully applied also in operational monitoring of implementation of plans, budgets, forecasts, projects, etc. at macro and micro levels.